List of services exempted under GST is given below for your ready reference.Most o them has been adopted from Service tax regime. Services by an entity registered under section 12AA of the Income-tax Act, 1961 (43 of 1961) by way of charitable activities. Services by Central Government, State Government, Union territory, local authority or governmental authority by way of any activity in relation to any function entrusted to a municipality under article 243 W of the Constitution. Services by a governmental authority by way of any activity in relation to any function entrusted to a Panchayat under article 243G of the Constitution. (d) any service, other than services covered under entries (a) to (c) above, provided to business entities. (b) services by way of renting of immovable property. (iii) of transport of goods or passengers. 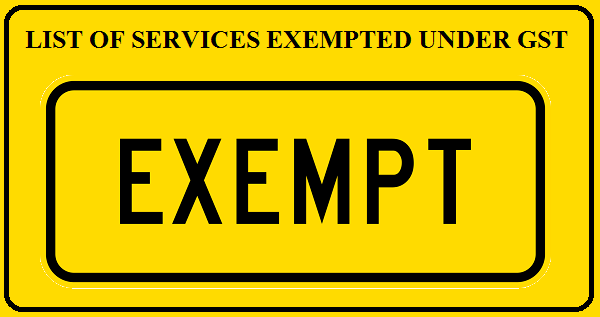 Provided further that in case where continuous supply of service, as defined in sub-section (33) of section 2 of the Central Goods and Services Tax Act, 2017, is provided by the Central Government, State Government, Union territory or a local authority, the exemption shall apply only where the consideration charged for such service does not exceed five thousand rupees in a financial year. (iii) renting of shops or other spaces for business or commerce where charges are ten thousand rupees or more per month. (c) stage carriage other than air- conditioned stage carriage. Provided that nothing contained in this entry shall apply on or after the expiry of a period of one year from the date of commencement of operations of the regional connectivity scheme airport as notified by the Ministry of Civil Aviation. (e) metered cabs or auto rickshaws (including e-rickshaws). (b) to a goods transport agency, a means of transportation of goods. Service by way of access to a road or a bridge on payment of toll charges. Services by way of loading, unloading, packing, storage or warehousing of rice. Services by the Reserve Bank of India. Services of life insurance business provided or agreed to be provided by the Army, Naval and Air Force Group Insurance Funds to members of the Army, Navy and Air Force, respectively, under the Group Insurance Schemes of the Central Government. Services by the Employees’ State Insurance Corporation to persons governed under the Employees’ State Insurance Act, 1948 (34 of 1948). Services provided by the Employees Provident Fund Organisation to the persons governed under the Employees Provident Funds and the Miscellaneous Provisions Act, 1952 (19 of 1952). Services provided by the Insurance Regulatory and Development Authority of India to insurers under the Insurance Regulatory and Development Authority of India Act, 1999 (41 of 1999). Explanation.— For the purposes of this entry, “acquiring bank” means any banking company, financial institution including non-banking financial company or any other person, who makes the payment to any person who accepts such card. (q) Niramaya Health Insurance Scheme implemented by the Trust constituted under the provisions of the National Trust for the Welfare of Persons with Autism, Cerebral Palsy, Mental Retardation and Multiple Disabilities Act, 1999 (44 of 1999). Services by way of collection of contribution under the Atal Pension Yojana. (c) business facilitator or a business correspondent to an insurance company in a rural area. Services provided to the Central Government, State Government, Union territory under any insurance scheme for which total premium is paid by the Central Government, State Government, Union territory. One time upfront amount (called as premium, salami, cost, price, development charges or by any other name) leviable in respect of the service, by way of granting long term (thirty years, or more) lease of industrial plots, provided by the State Government Industrial Development Corporations or Undertakings to industrial units. Services provided by the Central Government, State Government, Union territory or local authority by way of allowing a business entity to operate as a telecom service provider or use radio frequency spectrum during the period prior to the 1st April, 2016, on payment of licence fee or spectrum user charges, as the case may be. Services of leasing of assets (rolling stock assets including wagons, coaches, locos) by the Indian Railways Finance Corporation to Indian Railways. (b) a period of three years has not elapsed from the date of entering into an agreement as an incubatee. (ii) a business entity with an aggregate turnover up to twenty lakh rupees (ten lakh rupees in the case of special category states) in the preceding financial year. Services by a veterinary clinic in relation to health care of animals or birds. Services of public libraries by way of lending of books, publications or any other knowledge-enhancing content or material. Services provided by the Goods and Services Tax Network to the Central Government or State Governments or Union territories for implementation of Goods and Services Tax. (e) under the Panchayat Yuva Kreeda Aur Khel Abhiyaan Scheme. life forms of animals, except the rearing of horses, for food, fibre, fuel, raw material or other similar products or agricultural produce. Services by way of slaughtering of animals. Services by way of pre-conditioning, pre-cooling, ripening, waxing, retail packing, labelling of fruits and vegetables which do not change or alter the essential characteristics of the said fruits or vegetables. Services provided by the National Centre for Cold Chain Development under the Ministry of Agriculture, Cooperation and Farmer’s Welfare by way of cold chain knowledge dissemination. Services by a specified organisation in respect of a religious pilgrimage facilitated by the Ministry of External Affairs, the Government of India, under bilateral arrangement. Services provided by the Central Government, State Government, Union territory or local authority by way of issuance of passport, visa, driving licence, birth certificate or death certificate. Services provided by the Central Government, State Government, Union territory or local authority by way of tolerating non-performance of a contract for which consideration in the form of fines or liquidated damages is payable to the Central Government, State Government, Union territory or local authority under such contract. territory or local authority by way of assignment of right to use natural resources to an individual farmer for cultivation of plants and rearing of all life forms of animals, except the rearing of horses, for food, fibre, fuel, raw material or other similar products. Provided that the exemption shall apply only to tax payable on one time charge payable, in full upfront or in installments, for assignment of right to use such natural resource. Services provided by the Central Government, State Government, Union territory by way of deputing officers after office hours or on holidays for inspection or container stuffing or such other duties in relation to import export cargo on payment of Merchant Overtime charges. (b) another recognised sports body. Services of assessing bodies empanelled centrally by the Directorate General of Training, Ministry of Skill Development and Entrepreneurship by way of assessments under the Skill Development Initiative Scheme. Services provided by training providers (Project implementation agencies) under Deen Dayal Upadhyaya Grameen Kaushalya Yojana implemented by the Ministry of Rural Development, Government of India by way of offering skill or vocational training courses certified by the National Council for Vocational Training. Services provided by the cord blood banks by way of preservation of stem cells or any other service in relation to such preservation. Services provided by operators of the common bio-medical waste treatment facility to a clinical establishment by way of treatment or disposal of bio- medical waste or the processes incidental thereto. Services by way of public conveniences such as provision of facilities of bathroom, washrooms, lavatories, urinal or toilets. (c) up to an amount of five thousand rupees per month per member for sourcing of goods or services from a third person for the common use of its members in a housing society or a residential complex. Services by way of admission to a museum, national park, wildlife sanctuary, tiger reserve or zoo. (b) sports by charitable entities registered under section 12AA of the Income-tax Act. (c) recognised sporting event, where the consideration for admission is not more than Rs 250 per person as referred to in (a), (b) and (c) above. Life (Protection) Act, 1972 (53 of 1972). (i) Reference to “Chapter”, “Section” or “Heading”, wherever they occur, unless the context otherwise requires, shall mean respectively as “Chapter, “Section” and “Heading” in the scheme of classification of services. (ii) Chapter, Section, Heading, Group, or Service Code mentioned in Column (2) of the Table are only indicative.